For over 40 years we have researched all aspects of early regional cooking found in the kitchens of England, Wales, Scotland and Ireland – from the wrought-iron utensils to the authentic recipes the cooks used. From this research, and our own unique recipe book collections and original baking plates from the 18th and 19th Century, we have been able to faithfully recreate modern replicas and reproductions of Welsh Bakestones, English Griddles, Scottish Girdles, and Irish Hanging Plates. And alongside our shop, where you can purchase these bakestones, we have also created one of the most authentic regional recipe sites in the world for the UK and Ireland. Our hand-made reproductions reflect the regional differences found in bakestones from Wales, Scotland, Ireland and England. In our travels we have come across many regional variations, designs and embellishments in griddles over the years, however there are only really two ‘basic’ designs, the flat bakestone or the hanging bakestone. In this the shape and design of the handle is what most frequently changes, while the shape and design of the baking plate itself various less frequently, mainly in thickness and from oval, to round, and to a rectangle / lozenge shape. The most easily identifiable region of a particular bakestone comes from Wales, this classic design is closest to the old stone shape used for thousands of years to cook on. While the half-moon handle, with an eye or hook, to hang over the fire is a shape mainly seen in Scotland, England and Ireland. 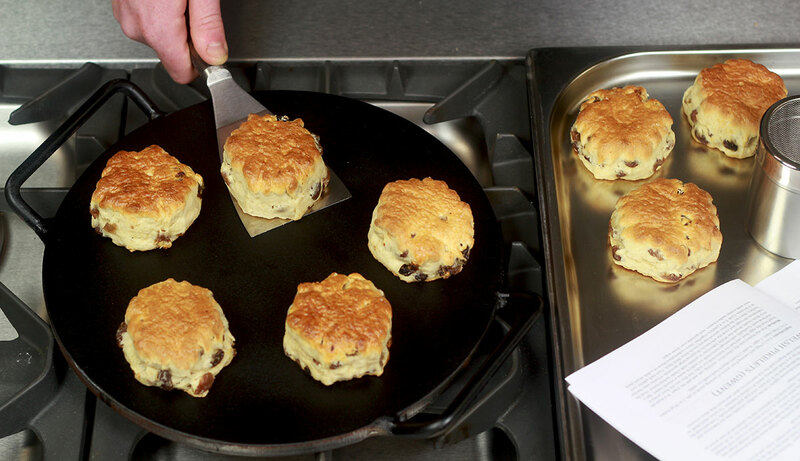 A traditional bakestone is a pleasure to cook on, and once you have received one of our hand-made bakestones or griddles it is time to step back in time and carry out an age-old process – the griddle is then ready to be seasoned. To read more about seasoning please see : ‘How To Season Your Griddle‘. Over the years we have sold thousands of bakestones and griddles, to all parts of the globe. We are a name you can trust – once the order is placed, and paid for, we will do our best to get the bakestone to you as quickly as we can using a courier service. If you have a question you can always email us and chat to us about anything, or about any special delivery requirements – just use the form on the contact page. Note: All the bakestones and griddles we make are made with authentic dimensions and thicknesses, this means that they are heavy, and this therefore reflects in the price for postage and packaging. If outside of the UK please contact us for a delivery quote.